A fatigued driver can be just as dangerous as a distracted or intoxicated one, if not more so. This is especially true of truck drivers, who are often forced to suffer the effects of neglected sleep and whose vehicles can cause massive damage in an accident. In addition to vehicular damage, drivers and passengers may sustain significant injuries, while more serious auto accidents can result in fatalities. It is therefore a good idea to understand this hidden danger and what you can do in the event you are injured by a fatigued driver. Our Brooklyn attorneys want clients to take the following information into consideration before getting into the car. Even without falling asleep, fatigue can have dire consequences. Depending on the area, between 10 and 30 percent of all car crashes are at least partially caused by drowsy driving. Some drivers may remain confident in their abilities, claiming to have never fallen asleep at the wheel despite being tired. However, there is a very good chance that fatigued drivers will fall asleep periodically without ever realizing it. “Microsleep” is a type of sleep episode that can last anywhere from a fraction of a second up to 30 seconds at a time. These brief instances of sleep tend to occur when a person is notably sleep deprived, and in response, the body attempts to recharge a little bit at a time. During these periods, the mind will trick itself into believing it has been awake the whole time by forming false memories or giving the impression of simple daydreaming. In reality, a driver may be engaged in intermittent periods of sleep, leaving the car to drift into another lane, veer off the road, or strike a nearby vehicle or pedestrian. Because of microsleep, it’s not enough for drivers to fight the urge to sleep; they must not have such an urge in the first place. Due to their profession and the size of their vehicles, truck drivers should be expected to be some of the safest, most attentive drivers out there. Unfortunately, the nature of the shipping industry rarely allows for optimal driving conditions. In some cases, drivers may be given a deadline that makes a full night of sleep (or even a moderate amount of sleep) impossible. Even when trucking laws and regulations are followed diligently, it would not be implausible for a driver to work 60 hours per week. Needless to say, the consequences of a tired truck driver can be deadly. Each year, roughly 20,000 Americans are injured due to commercial driver fatigue and 750 more are killed. 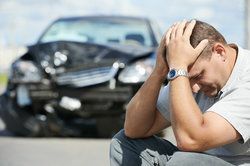 If you are injured in a car accident due to a fatigued or otherwise negligent driver, there are steps you can take to ensure you are not held financially responsible for the repercussions. If you are able to, it is a good idea to take any pictures of the accident and your injuries - the sooner, the better. Additionally, if there are any witnesses of the accident, be sure to speak with them and obtain their contact information for future reference. After the police have been notified, along with any necessary medical assistance, Gary A. Zucker & Associates, P.C. By consulting an attorney, you can build a case against the driver in the event he or she is not willing or able to compensate your damages. Don’t wait to speak with one of our knowledgeable lawyers. If driver fatigue has resulted in your potential financial loss, call us to learn exactly how we can help you.